The last time my wife and I stayed at the Copa Motel was in 2005, when we were back for my 40th class reunion. a few years later, someone posted to one of the review sites that he would rather sleep in his car than go back there. We agreed! 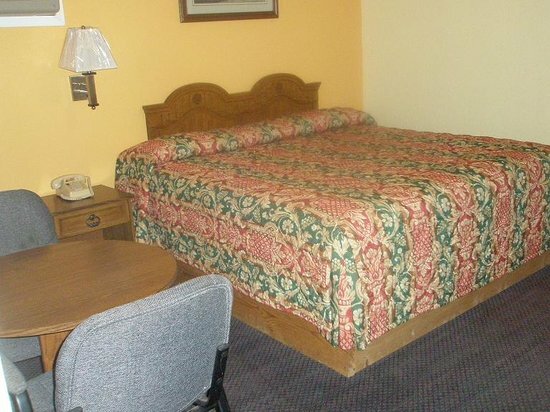 But, we also had read that the motel had been renovated, so we thought we would check it out for one night. We were very pleased. Our room, on the ground floor, was in the mid $70.00 range per night (tax included). It was clean, new carpets, new bedding, new furnature, free Wi-Fi, wide screen TVs (not the greatest definition, by the way). We ended up staying all seven days of our Kingman stay at the Copa. The outdoor pool was already closed, but that's a plus if you come during the Summer. McDonalds is right next door, for a cheap meal, and a good Chinese restaurant is just across the highway. Subway, Pizza Hut and Houdini's Pizza are just West on highway 54, toward town, as is White's supermarket, for anything you could want for in-room snacking (try the Art's and Mary's potato chips - the best ever!). Jeri's Kitchen and CJ's Lounge are located downtown for further dining options. and 4 miles south of Pretty Prairie. Sorry, we haven't stayed here, nor do we know anyone who has. If you have a review, email: webmaster@khsalumni.net and we will post your comments here. This is the former Savahana House B&B in downtown Kingman. It has only been open a few weeks, as I write this, so give them a little benefit of doubt as to the review. I only have one review, who booked for a week, but only stayed for one night. Lack of "hospitality" from the host was the reason for their shortened stay.